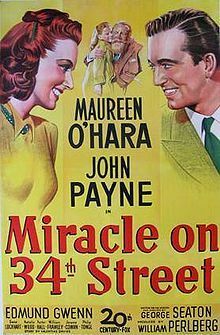 As part of my ongoing effort to create a warm fuzz around the Christmas holiday for my little kids, we sat together on my bed last night and watched “Miracle on 34th Street” on my Mac. I knew this was a bit risky since Sam is now eight and beginning to question the whole Santa thing, but ended up figuring Natalie Wood’s conversion might be just what it takes to put off the doubts for one more year. I was unprepared for how vehement his questions would be, how demanding he was to know how it would all turn out long before the film was anywhere near over, but given the fact that he’s been dealing with the inconsistencies of other 8-year-olds at school for the past weeks, it makes sense the boy wants answers. I, however, am not giving any. Although I am not unlike the mother in the movie in much of my thinking that one major function of childhood is to learn life lessons that will be useful in the decades that follow, I don’t see the belief in Santa as a dangerous delusion. Like the Tooth Fairy and the Easter Bunny, the jolly fellow is a little bit of magic, and we need magic. Magic is imagination, and although kids certainly benefit from the accumulation of practical skills, without imagination they are handicapped for life. The day comes, though, when mental conjurings of reindeer on the roof … and that bowl-full-of-jelly thing that took my mind in strange directions as a kid … give over, often in some sort of epiphany prompted by discoveries made in the back of closets. The accompanying Hm … may be followed by feelings of distrust over being mislead, but most kids are smart enough to realize that being a nasty little git about that with Mom is an even worse idea this time of the year than it had been when Santa was assumed to be the provider of loot. It’s a sadder day for Mom, though. For us it’s one of those watershed moments when our child takes a step away from childhood that forces us to wrestle with the fact that kids grow up way too fast. What’s important to remember is that the step away is also a step toward, and even if we’d like to keep our kids little for as long as possible, they actually want to grow up. Since that’s the natural order of things, there’s no sense in trying to stop any flooding from any watershed. So, from one Christmas to the next, all can change, and the child whose eyes shone with the wonder of Santa’s visit begin to glow with the avarice of gifts … and with an understanding of the joy of giving. you are SO right. It has been on my mind for weeks now. lets see what happens as they “move” on. and in your case in particular. hmmmm . . . i am a prophet. wait. . . wait. . . its coming to me! they discover that the make belief land of santa and the tooth fairy was preparing them for the adventure of a lifetime. the one that guides them to this life of discovery is YOU. you are opening up to them. you are migrating their minds from santa to the magical world of ghosts and models. They will learn about Quarks and bosons and particles that we have never imagined growing up. places in the mind where the “id” lives! santas and tooth fairies – so complex that it boggles the mind. but in the end these are all concepts that we build in our mind. models about how life works and life will always remain infinitely MORE than our models. Sam, you are building dreams and castles for the kids that they will be able to devote many lifetimes to study. Billions upon billions of galaxies to explore. billions upon billions of the most amazing models to build and dream up. Im reminded of Einsteins wife saying to Hubble when she was told that he explores the universe through telescopes: Oh, my husband does that on the back of an old envelope. sam, you inspire and you build the most amazing worlds in your mind and you teach the kids how to construct in the ether of all of reality. I have a very interesting/unique take on the whole Santa thing. My mother, a very spiritual, wandering soul, just happened to be dabbling in the “Jehovah’s Witness” faith when I was a child, so by de facto I was too. I always knew the myth behind Santa Claus and had to go to school with the instructions that if my friends asked me if he was real to reply, “I think you should ask your parents.” I never gave it away to anyone. I understood it was important to them and would be cruel to say anything to ruin their fun. And it gave me a bit of a superiority complex, if anything. We quit the church and started celebrating holidays and birthdays when I was around 16. I’m just turned 25 now, so I celebrate everything like a 9 year old. But I regret nothing. I liked knowing the reality behind the myths. I felt special, knowing the truth. One day I will have children, and I think I’ll tell them from the beginning like my mother did for me. We can share in our special secret, just me and my kids, winking and smiling behind people’s backs. Knowing the truth about Santa because of religion seems a bit like substitution rather than revelation. Without the dogma, it may be more difficult for you, Liz, since “from the beginning” can’t mean you start whispering this into an infants ear, but instead will find yourself addressing issue after issue as they arise and your children grow. As a child, I felt angry and deceived at my mother when I found out there was no Santa. I got over it (I think). As a parent, my feelings were ambivalent. One part wanted to carry on the tradition. The other part felt a guilty deceiver. Don’t know what I’d do with kids at this stage. Either way, Christmas was a chore and for the most part still is. Although, I like the get-together part with friends and family (mostly). I like Eben’s response too. Agreed. And I always like Eben’s responses.